BeamChek 2017 is the easiest to use beam/column design application in its class. 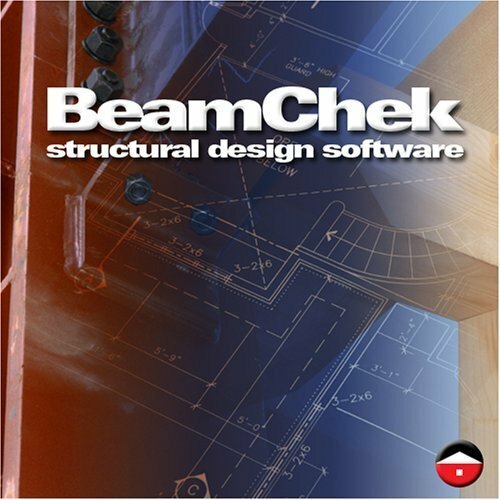 Fast, intuitive, accurate, BeamChek is preferred by architects, home designers, engineers, contractors, and building/plan inspectors across North America. Size & check wood and steel beams, columns, flitch plates, joists, and rafters with speed and confidence. The integrated BeamChek database includes steel, wood, timber, glulams, machine-evaluated lumber, and structural composite lumber such as LVL's. Compare beams in two species groups, each in two grades, before you select a specific member width, depth or grade. Increased log diameter to 36"
PC running Microsoft® Windows® 10, 8, 7, Vista, and XP. BeamChek ships on a CD-ROM with a printed instruction manual and examples. MAC versions are not available, however many users successfully run BeamChek with Windows emulation software on Mac OS-X. BeamChek is part of a new generation of simple, no-nonsense software solutions designed by professionals for professionals. BeamChek's intuitive, easy-to-use Windows interface saves you time, money and puts profits in every design. The following features (many requested by our users) have helped BeamChek evolve into the fastest and easiest to use software of its kind. Calculate either simple span beams or beams overhanging a support at one end. Up to a dozen live and total loads may be entered for a single beam including six point loads, five partial uniform loads, and a uniform load. You may also size hips and valleys with a uniform increasing load plus a normal uniform load. Solid-sawn members range from 2 x 4 to 14 x 16, and include multiple, built-up 2x members (up to four). Grades No.1 & No.2 are offered in twelve species groupings (52 species in all) using National Design Specification® Values. Custom grades and species may be evaluated for most species with user entered values. Glu-laminated members are available in two species groupings, Douglas Fir and Southern Pine, with four grades for each (two grades are for overhanging beams). Sizes range from 3-1/8 x 9 to 10-3/4 x 31-1/2, which meets almost every use encountered in typical residential construction. Custom glu-lam grades, glu-lam 'header' sizes, and LVL beams in common stock sizes from several manufacturers may also be analyzed with user entered values. Values may be saved to disk for repeated use. BeamChek will size A36 wide flange steel up to W 18 x 130, standard flange up to S 24 x 121, channels up to C 15 x 50 and A46 rectangular tube shapes to T 20 x 8 x 5/16. Analysis includes web yielding and crippling with minimum bearing area in lieu of web stiffeners. Built-up and solid wood columns to 10 x 10, plus steel columns in round and square shapes complement our wide selection of tools for the residential designer. BeamChek quickly calculates hundreds of beam possibilities filtering out all but the most appropriate sizes and presents them in an easy to compare table that includes two grades in two species groups and glu-lams too. The easy to read, organized report lets you readily determine if a beam is adequate without scrutinizing the numbers. The percentages compare critical to actual attributes of your selected member. You may modify the selected beam’s width or depth with a mouse click and have it recalculated instantly without leaving the form! The dead load deflection can be reviewed for its impact on the beam's appearance in the project. Reactions, live load reactions, and possible uplift.Maximum moment, shear, and reduced shear.Total beam weight and beam weight per foot.Total load, live load, and dead load deflections.Suggested camber for simple span glu-lams.Minimum required bearing area for both reactions.Base values, adjustment factors, and the adjusted Fb, Fv, E, Fc values. Print a complete beam check record including a loading diagram to any Windows supported printer. Include a two line page heading, beam description, your initials and date, if you wish. Save your beam criteria input (loads, etc.) to a disk file of your choosing for future retrieval. Save the beam data record (data from a beam analysis) to a disk file for future printing.